Literature: The reference 6263 "FAP" is illustrated in Ultimate Rolex Daytona by Pucci Papaleo Editions, pages 384 to 387. 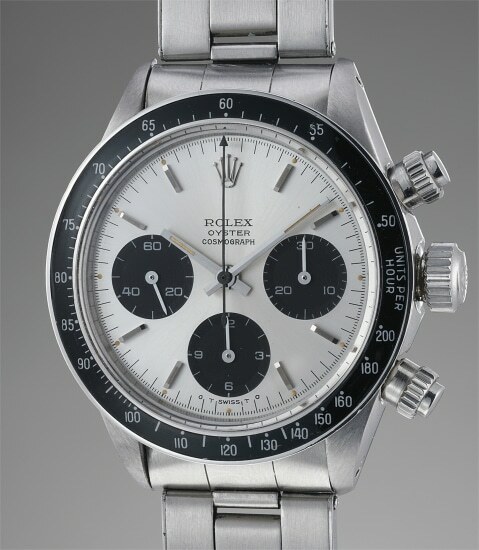 It seems unimaginable to the collectors of the present day that a wristwatch as collectible as the Rolex Daytona was issued to members of the armed services. But such was the case with the Peruvian Air Force, or Fuerza Aérea del Peru (“FAP”), who ordered Rolex watches for their pilots. They ordered another brand of chronograph watches before the early 1960s, but eventually that was overtaken solely by Rolex, supposedly due to a relationship with the eminent Rolex authorized dealer in Peru. Typical of special-issued Rolexes, the serial number between the lugs is repeated within the inner caseback. There is a small hole on the outer case back, near the ‘teeth’. This hole was used to secure the case back while Rolex stamped the markings. This example also bears a rare “Sigma” dial, indicated that the indexes were struck in white gold – a little bit of luxury for the rugged military type.